I told ya all about my Fig and Ginger Jam yesterday, right? 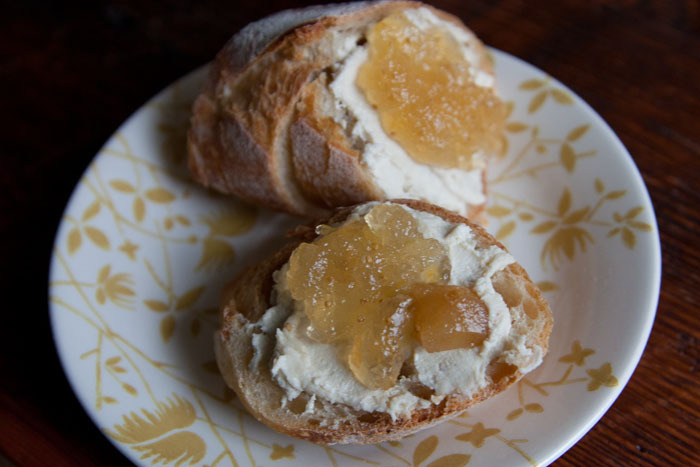 Well, while I was busy at work making the jam, Julian was working on the cream cheese recipe by Miyoko Schinner in the recent Cheese Issue of VegNews. Each of these things are wonderful standalone toppings, but when spread together on a baguette, they become pure magic! Don't believe me? Try it for yourself. Sooooooo goooooooood. The jam, as you can imagine, has a nice ginger flavor that isn't too over-powering. You get extra jolts of gingery goodness when you get a chunk of the crystallized ginger, as you can see here. I realized after taking this photo that strangely, there weren't any fig chunks in this plop of jam. The creamy, slight smokiness of the cream cheese adds a richness to this snack. Seriously, this is good stuff. You know, I'm not sure why the phrase "When life gives you lemons, make lemonade" exists. 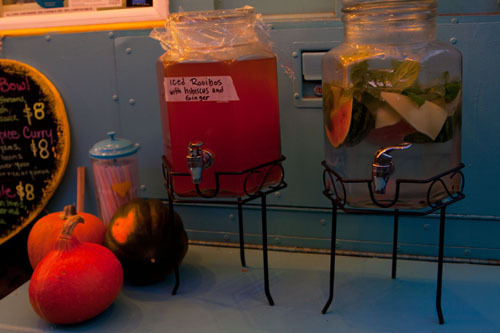 They're not just some sour, single-use ingredient. I put them in everything. Enough about lemons, though. 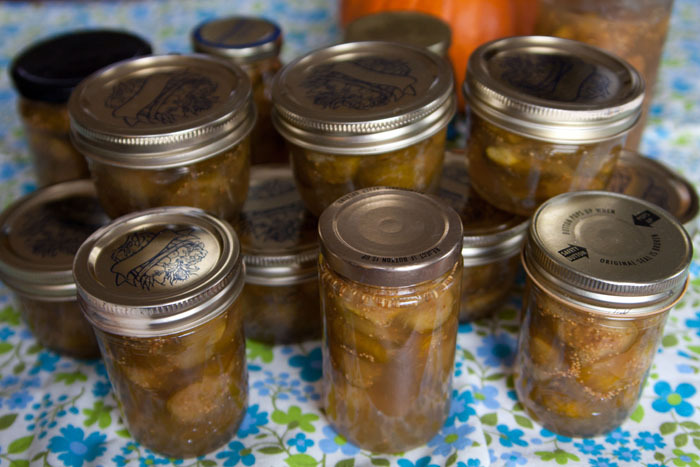 Today we're talking about figs, and more importantly, fig jam! 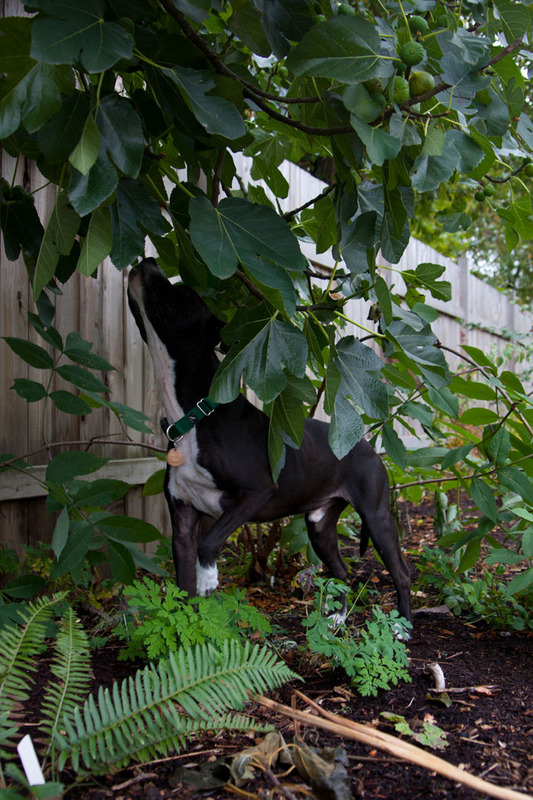 Our neighbor has a 20+ ft tall green fig tree in her yard, which happens to have sent a bunch of branches over our way. 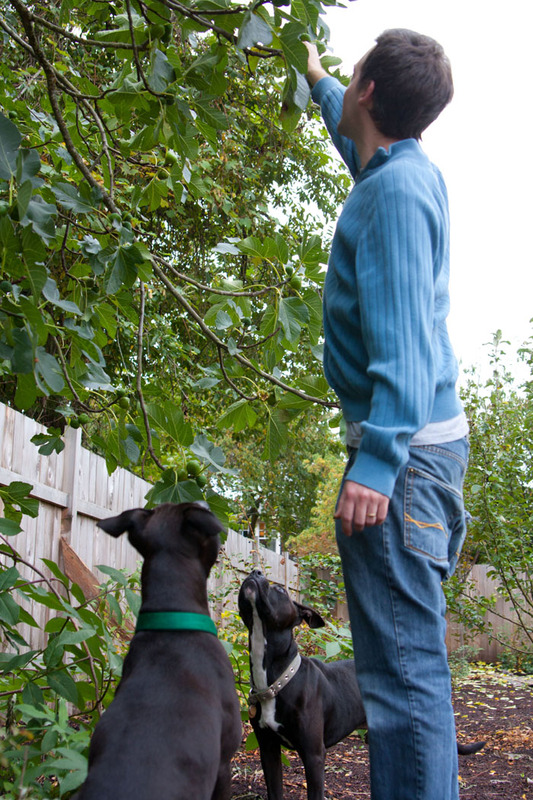 We're not complaining and neither are the dogs, who immediately zoom to the spot below the fig tree when they're let out. 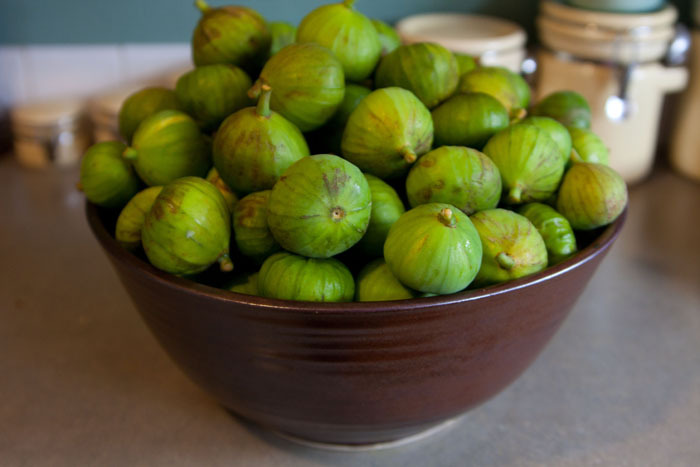 Yesterday I set out with my ladder and my biggest colander (which I had to empty three times) to collect roughly 170 figs (and I left a ton on the tree). Remember, this amount was only from the branches that have grown over from our neighbor's yard since Feb 2011 when we put up the fence! Basically, I got a lot of figs. This photo is deceptive. This bowl is HUGE. I ended up only using half of these. I am not a canning expert, so I mostly just followed the directions that came with my pectin box. 1. 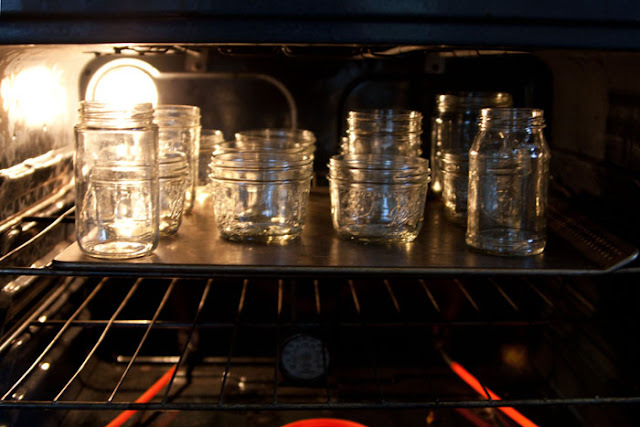 I sterilized several jars (although not enough, so I ended up making a few jars to keep in the fridge) and their lids. As they were sterilizing I began chopping figs and preparing the rest of the jam. Sterilizing the jars at 350* F for 20 minutes. 2. I quartered figs until I had 24 cups of fruit, which was all that would fit in my biggest soup pot. I placed them in the pot along with the water, lemon juice, lemon zest, and that calcium water made from a packet that came with my pectin (yours may differ). I cooked this over medium heat, stirring occasionally, until the volume decreased by half and the figs were pretty soft- about 10 minutes or so. 24 cups of quartered figs! 3. 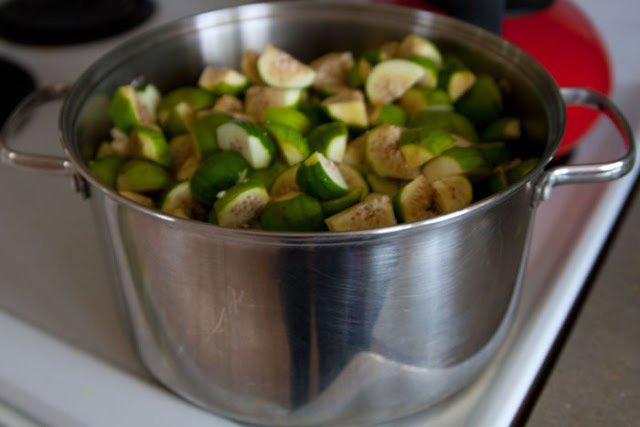 I mixed the pectin powder (your directions may differ) with the sugar, then added the mixture to the figs, stirring continuously for 1-2 minutes. Then I brought the mixture to a boil and removed it from heat. 4. I filled my jars, leaving 1/4" of space on time, wiped the rims clean, screwed on the dried lids, and tightened the lids until my wrists hurt. I gave them a boiling water bath for 10 minutes. Oh we did some very yummy things with the jam last night. More on that tomorrow! 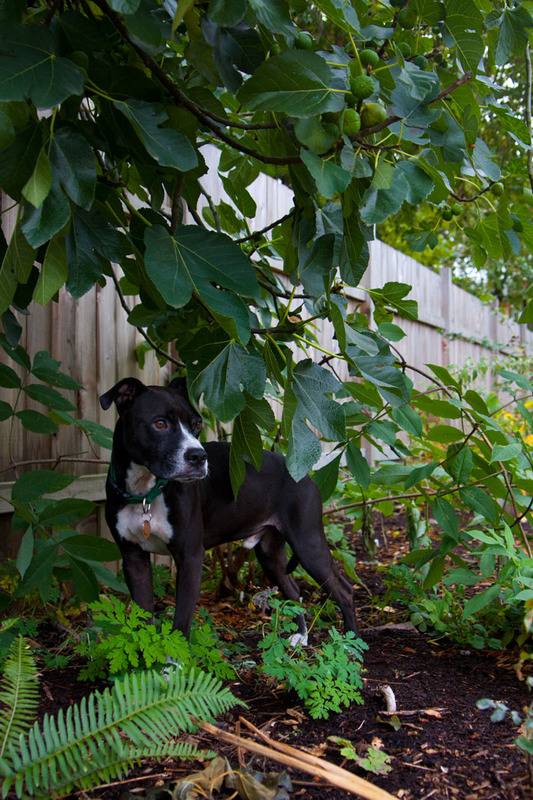 For now, some more dog and fig photos! Emerson Fig Lover, has become quite adept at standing on his back legs to position himself directly under a particular fig. He'll even stay outside in the rain, something he ordinarily avoids. Getting Emerson to look at the camera has never been easier. A fig was the answer. A simple soup with a smile. 1. Let the cashews soak in 1 cup water for an hour or so. Then blend until smooth. 2. Boil the squash in the remaining water until soft, about 10-15 minutes. Add the garlic and cashew mixture and blend until smooth. Return to pan. 3. Add the corn and continue simmering until corn is cooked, stirring every so often. 4. Top with hot sauce. On Friday I announced the secret ingredients, potatoes and sesame, for the second Iron Chef Challenge on the Vegan MoFo website. 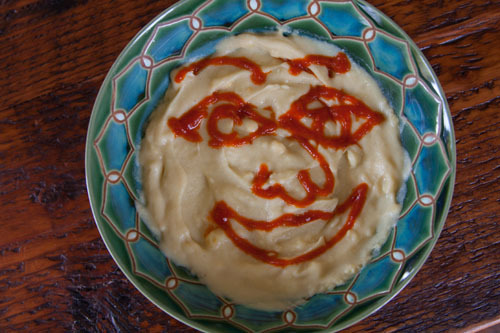 Technically, since there is no winning or losing in the Challenge, it probably would have been okay for me to participate, but I would have felt strange promoting my own dish on the MoFo site. Instead, I will feature it here today! I made a slow-cooked Indian Potato and Tahini Stew. Everyone seemed to like it, since it was gone in a matter of hours, with only a small amount for Matt to take to work tomorrow. 1. Add dried chickpeas and four cups water to slow cooker and cook on high for two hours. 2. After two hours, add the remaining ingredients except for the salt, lemon, and hot sauce. Stir to combine well. Cook on high for two more hours, or until the potatoes and chickpeas are soft. 3. Add salt, if needed, and lemon juice, hot sauce, and sesame seeds. 4. Serve over rice or eat as is. 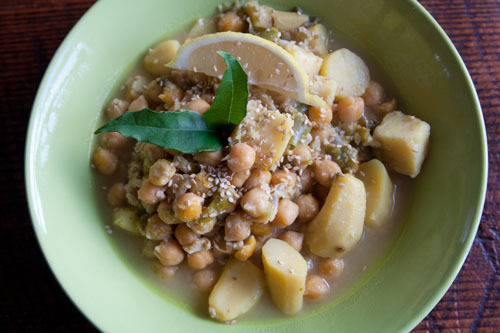 *You can substitute six cups of canned chickpeas for the dried chickpeas and four cups of water, adding them in Step 2. By the way, did you see the entries for the Challenge? 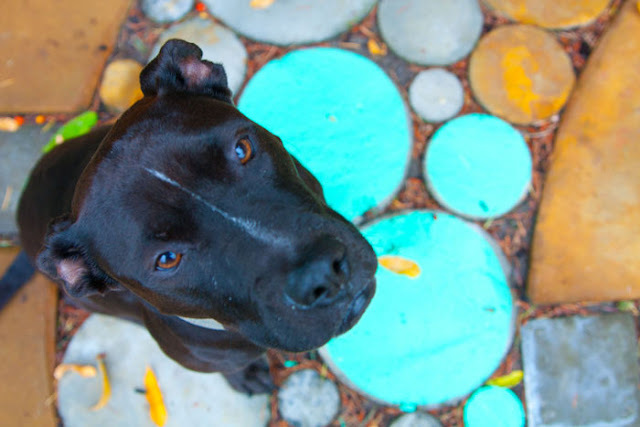 Take a look at the Round Up here. Those knishes- wow! Inspired by, Kittee's kitchen tour post from a few days ago, I decided to snap a few shots of my work-in-progress kitchen. The natural light coming in from the windows makes all the difference throughout the year. I stand at my sink and overlook the back garden, which is a real treat! The electric range, which is caving in in the middle and has a broken drawer and only two working burners, will be on its way out soon. We plan to replace it with a white double-oven gas (or dual fuel) range. 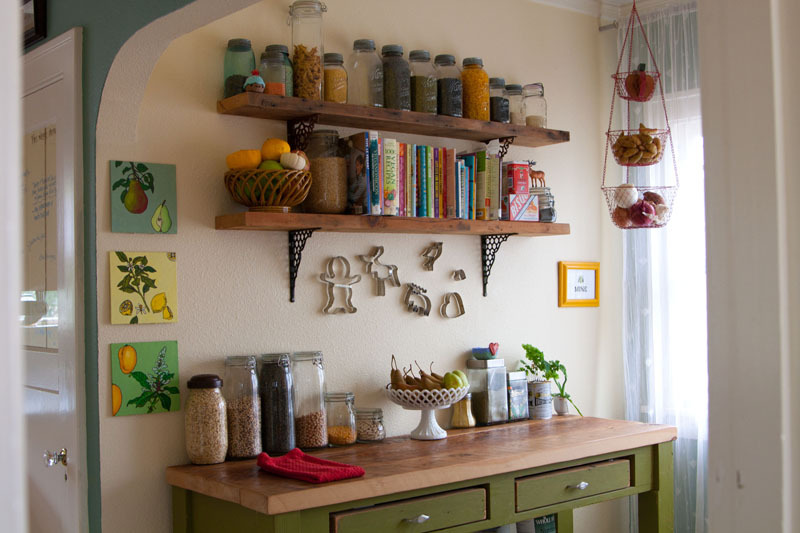 This is the breakfast nook-turned extra kitchen prep area. My friend, Joel, and I built this piece from reclaimed wood, although it's not quite finished. 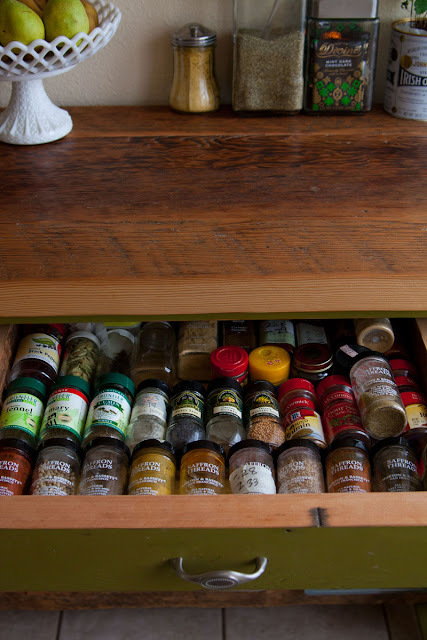 Below, we store things like the VitaClay rice cooker, and various food stuff like oils and vinegars. See that cute crocheted cupcake on the top shelf? That was a gift from a U.K. swap buddy. 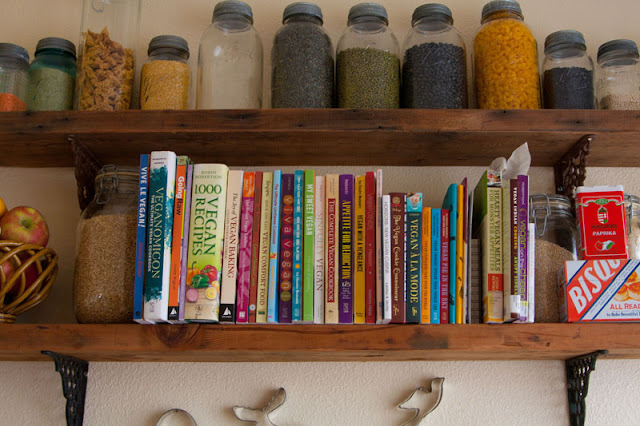 The shelves, also reclaimed wood, hold jars of grains, pasta, beans, and other items we use frequently, as well as our vegan cookbook collection! Non-vegan cookbooks reside in the dining room. The books on the end are library rentals! The drawers contain some of our spices and teas. 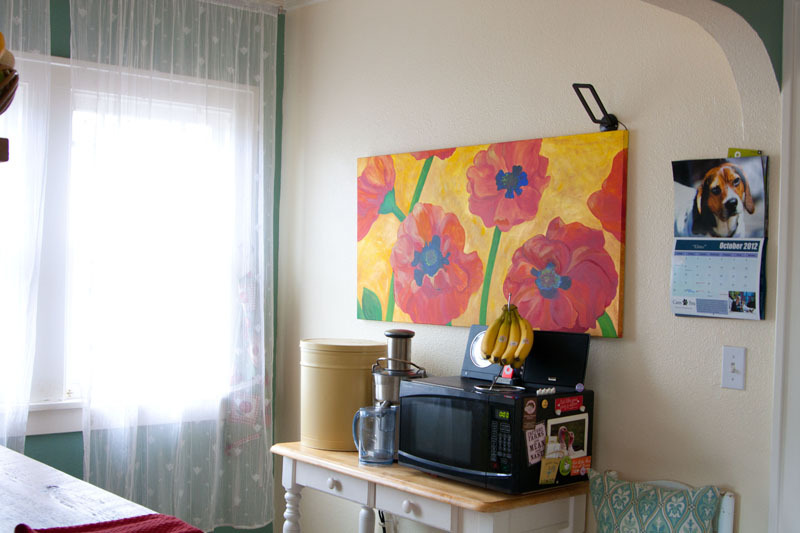 Juicer, popcorn can-turned kibble container, and other items live on the other side of the nook. 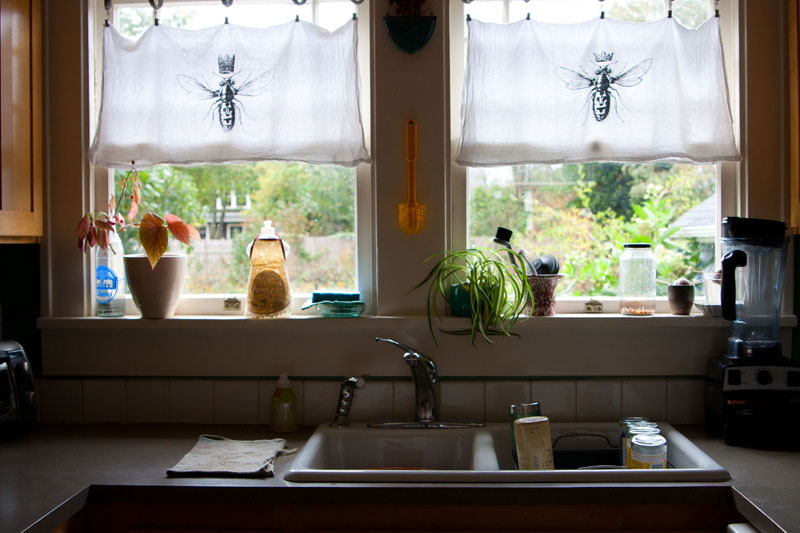 The bee curtains were actually hand towels I purchased on Etsy. We love bees (if you couldn't tell from the other photos!) You can also see the adorable soap bottle apron my grandma made. I spy Matt's favorite kitchen gadget in the bottom right corner. I turned the broom closet off of the kitchen into a pantry. After a lot of searching, I found a shelving unit that fits almost perfectly inside. 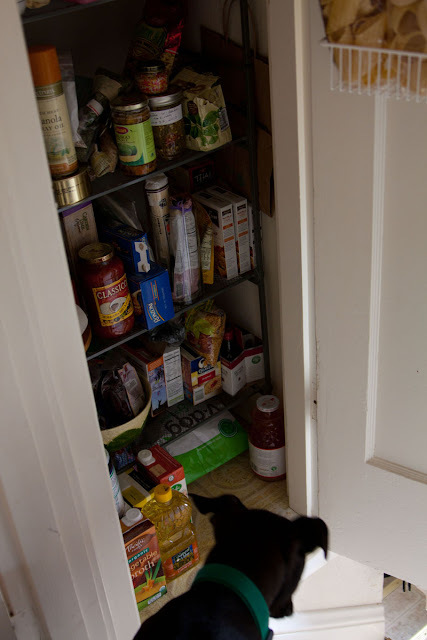 Andy peers at the somewhat usual pantry contents. 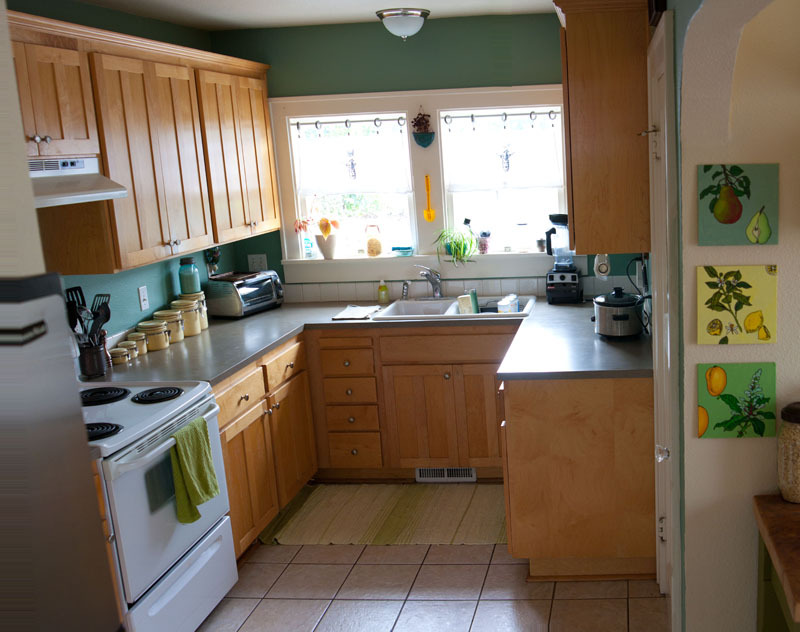 I am in love with the color I painted the kitchen. I got the paint mixed at Miller, but the color is Farrow&Ball's Chappell Green. 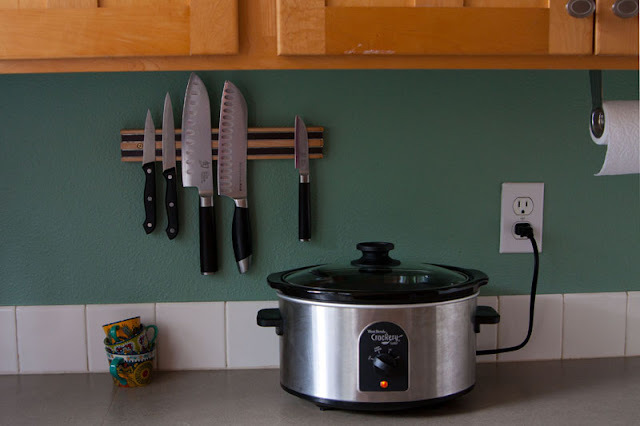 My beloved measuring cups, magnetic knife strip, and slow-cooker. And, while I like my thrifted dishes and glasses, I decided not to bore you with glimpses into all of my cabinets. I'll leave you with this colorful photo of some of my bakeware. 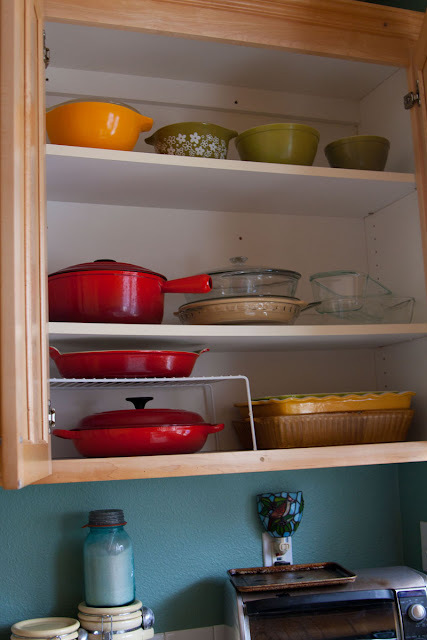 Le Creuset, I love you. This concludes the tour of my kitchen. I looooove peaking into other peoples' homes, so if you have a link to your very own kitchen tour, please do share it below! I got an email from my favorite candle company, Soy Candles by Phebes (vegan owned and run! ), and as I was perusing their various offerings, I found the Hot Cocoa candle. Then, of course, I decided I wanted to treat myself to some hot cocoa. Now, as I sit here and write this post, I am sipping on a creamy, steamy mug of hot cocoa with Dandies marshmallows. I thought I'd give you my easy-peasy no fuss "recipe" for hot chocolate that comes out perfectly every time. 1. Throw the chocolate chips in a small saucepan over low heat. Stir until melted. 2. Raise the heat to medium, stream in the milks, and stir until no clumps of chocolate remain. Pour into mugs. 3. Top with optional toppings. *It's Fair Trade Month. If you're not already purchasing strictly fairly-traded (certified or not) chocolate, I hope you'll take this opportunity to do some research. I've had a hankering of late for crunchy sweet squares of rice cereal. It all started when Amy posted her Double Chocolate Crispy Treats last week. Ah, yes. I remember it well. I found myself part of a group of folks helping out at a vegan bake sale to raise funds ($1,452.50 as it turned out) for the Sanctuary Century, and subsequently three animal sanctuaries in the area. I was doing my thing, hooking up passers by with tasty treats in exchange for their donations, when I spotted them. Those perfect squares, both crunchy and chewy, sweet and peanutty. Yes, these were peanut butter crispy rice treats. Sadly, I don't know who made them, or which recipe was used. You can see the peanut butter crispy rice treats in the background of this photo I snapped. Perhaps I should write a "Missed Connection" or perhaps too much time has lapse. Well, if you're reading this, mystery baker, I would love your recipe. 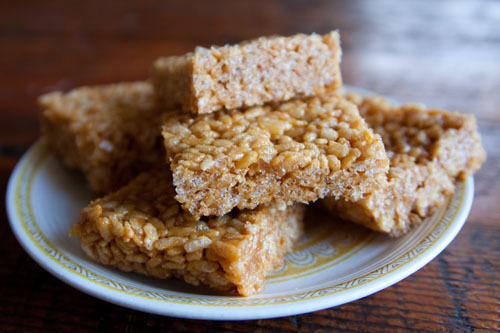 Anyhoo, I decided I wanted to make peanut butter crispy rice treats, so I consulted the internets, found a recipe that contained ingredients I had on hand, and got crackin'. When I say "crackin'," it kind of implies that these are a lot of work. They're really not. The might be one of the easiest desserts ever. These were good, but perhaps not as good as the ones from the bake sale! Today I picked up a bag of Dandies, so it might just become a crispy rice treat party in this house. Kale gets consumed pret-ty quickly in this house, so it's not often that it makes it into chip form. 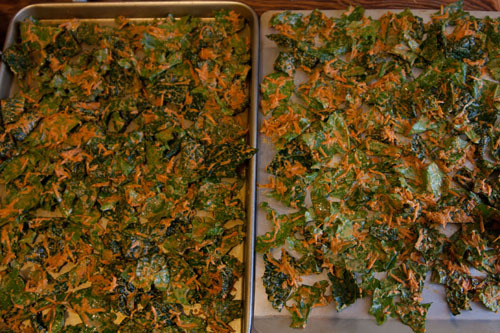 However, when I have a hankering for kale chips (and a little time to babysit chips in the oven), I make The Tastiest of Kale Chips. Damn you, early-setting sun! Craptastic nighttime photo. 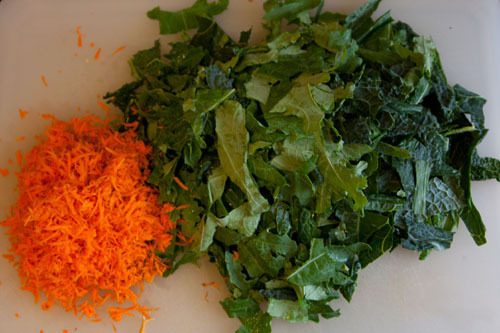 This time I used a gigantoid carrot from our garden, along with kale from our garden and the garden of a friend's. 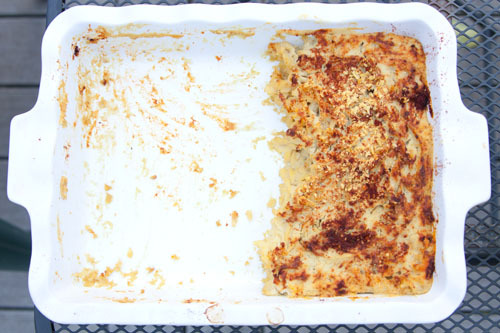 I doubled the recipe and spread it out on two baking sheets. Then I baked the chips at 275* F, flipping them every 20 minutes until they were crisp. Next time I will decrease the amount of liquid in the recipe to speed up this process. Yup. 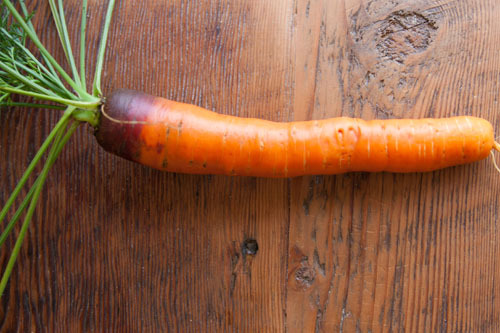 It's Monday, so it's time for a peak into my CSA box this week. 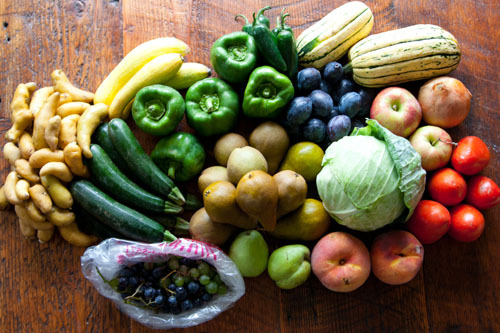 That's: six zucchini, three yellow squash, four green bell peppers, eight jalapenos, 14 plums (give or take), two delicata squash, one yellow onion, two apples, five tomatoes, two peaches, one head of cabbage, two green pears, eight bartlett pears, a few bunches of grapes, and a whole mess of fingerling potatoes. So far, I'm thinking some sort of jalapeno poppers are in store for us this week (especially since we still have some peppers left over from last week), possibly a creamy pear/squash soup like this, sauerkraut (after Julian's successful attempt several weeks ago), and probably some pickled jalapenos, too. Does anyone have a fantabulous zucchini bread recipe? It's kinda the only way I like zucchini and I'm looking for the best recipe out there. Oy. 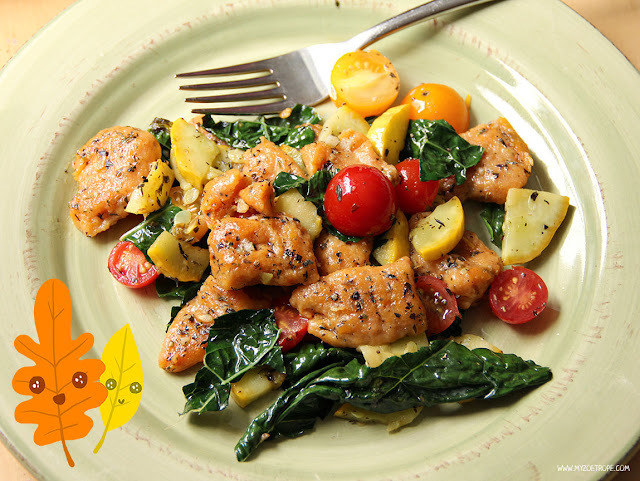 We still have veggies to use up from last week, too! So many veggies! Sometimes, as you're passing through a part of town you don't normally frequent, you serendipitous remember there's a great place to stop just around the corner. Yesterday this was the case for me. It had been a while since I visited Bui Natural Tofu, a great, authentic (if the Vietnamese customers are an indication) Vietnamese spot to pick up a whole bunch of good things. A. 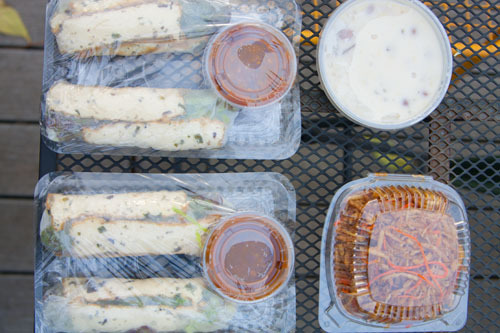 Four freshly-prepared summer rolls with the lemongrass tofu that Bui makes from scratch and a sweet and spicy peanut sauce (you can buy these at New Seasons, locally, but they're more expensive). These rolls are so good. I should have bought more. I brought them home, ate two of them, and let the other three humans in the house share the remaining two rolls (after having a couple of bites from one). B. 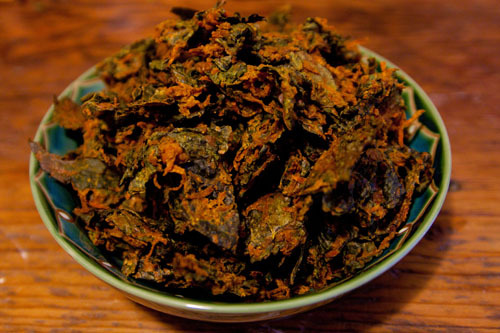 One container of Bi Chay, which according to the internets can contain several ingredients. I *think* this one had slivered tofu and potatoes, coated in a rice flour mixture, and fried. I had the intention of rolling this up in some summer rolls, but ended up eating some of it out of the box with chopsticks. C. And one container of coconut tapioca pudding with peanuts, mung beans, agar jelly things, and fungus. I didn't care for the texture of the fungus with the other components, but otherwise this was tasty. Well, I did it! After a prompting from Amy's post, I made Kittee's Mac n Cheesie Southern Style from Papa Tofu Loves Ethiopian. And it was good. The only way I could keep us from gobbling it up immediately (and thereby not have any leftovers- a sin in my book), was to make a bunch of other accompanying dishes. It worked! We might not have a lot left, but two of us will get to enjoy leftovers! This recipe was smokey and creamy and everything a mac and cheeze dish ought to be. A winner! I recommend buying a copy of Papa Tofu Loves Ethiopian. Every dish I've made from the booklet has been super tasty and wonderful. 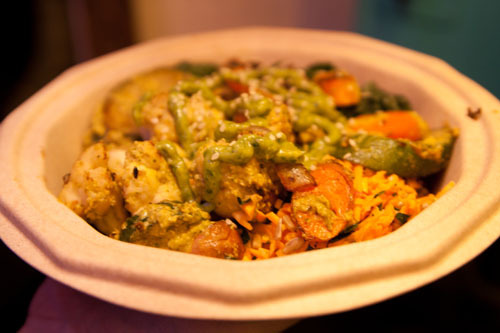 Vegan MoFo: Some good looking stuff! Today's post is a little pictorial summary of a few of the Vegan MoFo posts that have caught my eye so far. I've filed these recipes away to make, probably post-MoFo, but perhaps during! Mama et de bebe hawk made some beautiful pumpkin tamales. I've never made tamales, but I sure do love them, so I'm going to give this recipe a try! 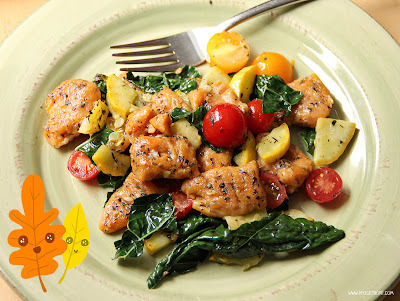 Featured in an official Vegan MoFo Roundup, My Zoetrope's Sweet Potato Gnocchi dish looks yum yum yum. Amy made a batch of Kittee's Mac and Cheezie over at TahiniToo. How is it that I haven't made this dish yet? This one is on my "to make this week" list. 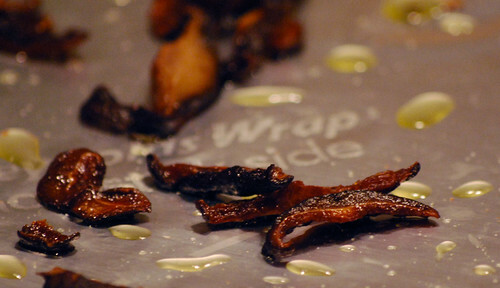 Crispy Shitake Mushroom Bacon was sizzling over at Inspired Vegan Eats and hopefully will be sizzling in my house soon, too! 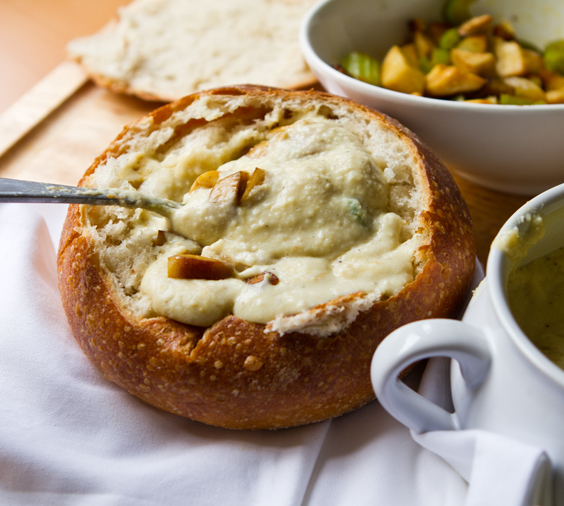 A creamy, thick mushroom soup in a bread bowl? Oh yeah! I saw this Vegan "Clam" Chowder over at Healthy Happy Life and I was kinda in love. I'll end on a sweet note with another post from TahiniToo. Just look at these Double Chocolate Crispy Treats! I wish I could sink my teeth into one right now! Is there another dish that I need to add to this list this MoFo season? Tell me, tell me! 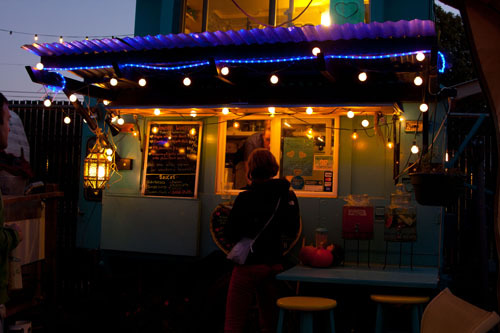 There's a new food cart pod in town (and near my house!) 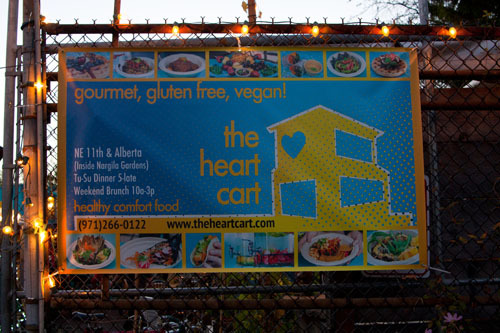 and it's now home to the gluten-free and vegan Heart Cart. And guess what? Tommasina has hooked up PDX MoFoers! 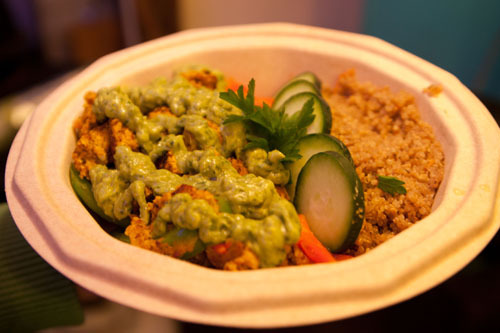 During Vegan MoFo, bloggers can get 1/2 off on an entree. See the details here. Onto the food. 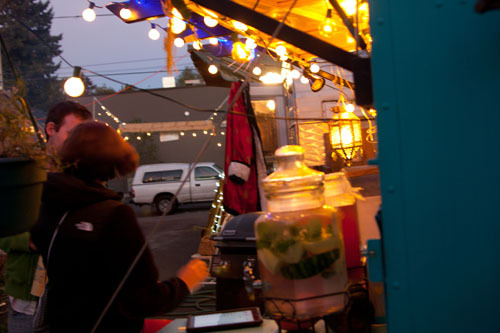 Matt, Julian, Tommasina, and I had dinner at the cart last week. 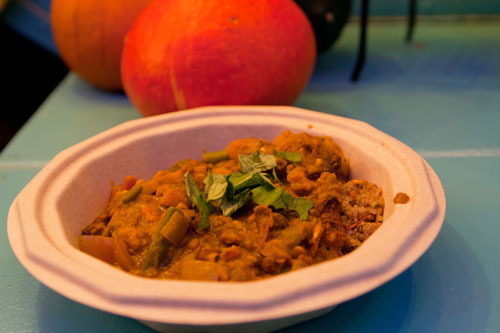 Tommasina ordered the Autumn Spice Curry. 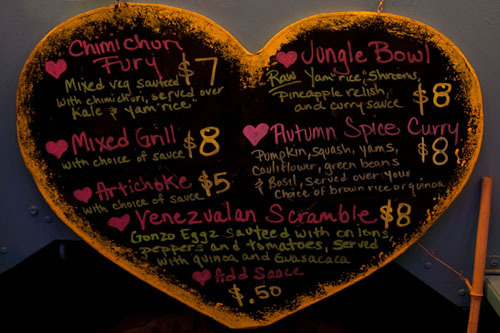 Julian got the Valenzuelan Scramble. Matt ordered the Chimichuri Fury. 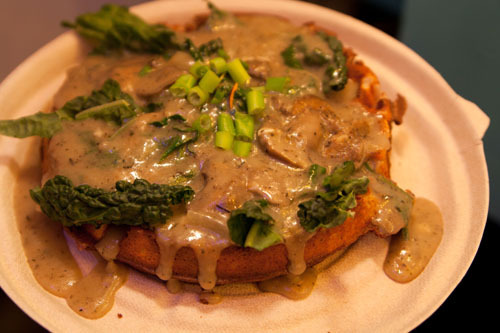 And saving the best for last, I got the Country Gravy Waffle with Kale. This one was seriously good. I think everyone voted it as their favorite. The waffle was crispy with a fantastic flavor (I opted for the rosemary & garlic waffle base instead of plain) and the gravy was both a little zingy and earthy. 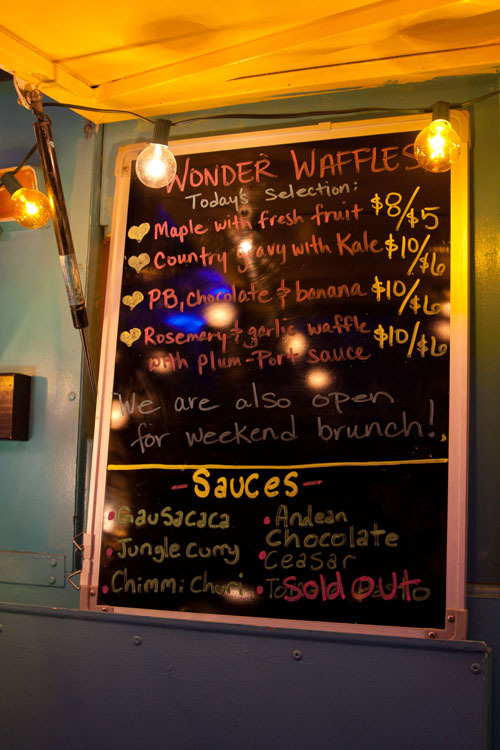 This was perhaps my first savory waffle and what's not to love about mushrooms and kale on a waffle? Now go get some xgfx (as Kittee would say) waffles and save some mulah! *Heads up- The pod is super sweet with lovely sofas and a great ambiance. However, there's a bonfire going at night, so if your sensitive to smoke, be warned! How is Cleocin used to treat lupus? Gardening tips, recipes, project ideas, and plenty of photographs!